The room tariffs in and around the Kumbh Mela site has gone up by more than 100 per cent, as the supply is not able to meet the huge demand for inventory. Almost 14 crore pilgrims come over the 49 days of celebrations that started this week in Prayagraj. Travel service providers say too limited inventory is available, as the celebrations occur only once in six years. More visitors are expected this time compared to the last Kumbh, as better air, rail and road connectivity is supporting arrivals. “There are a few two-star and three-star hotels in the 100 km radius of the venue. Then there are guest houses that can provide accommodation to only a portion of the visitors. Starting from January 1, in all these hotels and guest houses, tariffs have shot up by more than 100 per cent. A room with basic amenities that would cost Rs 2,000 per night in a normal day, is now available for Rs 5,000 and more,’ said Kapil Goswamy, MD, BigBreaks.com. Karan Anand, head, relationships, Cox and Kings, says several accommodation providers have come up with temporary tents that are priced differently as per the amenities available. Cox and Kings is promoting The Ultimate Travelling Camp (TUTC) for the Kumbh and has witnessed good demand for them. “The demand for this year’s Kumbh Mela is very encouraging and it is primarily from the domestic market. The demand is much more this time compared to the previous Kumbh that took place in Allahabad (now Prayagraj) in 2013,” said Dhun Cordo, co-founder, The Ultimate Travelling Camp (TUTC). “Our camp, the Sangam Nivas has a total of 44 luxury tent accommodation and it is equipped with all the modern conveniences. We have weaved in exclusive activities specially curated to enhance the Kumbh experience. Guests can opt for yoga and meditation classes or enjoy the Kumbh Mela on an early morning boat cruise and watch devotees by the river banks offering prayers,” Cordo said. Two-days/one-night package of the luxury tents of TUTC is priced Rs 12,250 per person and super luxury tent costs Rs 20,750 per person on a twin-sharing basis. 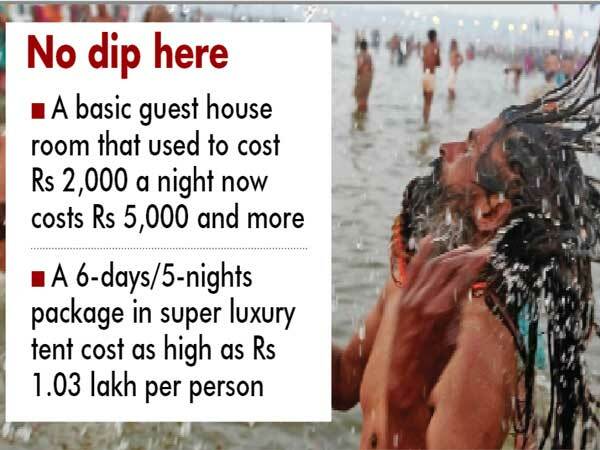 A six-days/ five-nights package in the super luxury tent can cost as high as Rs 1.03 lakh per person. This year luxury tents are attracting more number of foreigners and also affluent Indians. As many as 4,200 tents with basic amenities too are available and these have bedding capacity to accommodate 20,000 people.